Includes: processor, memory, and three Ethernet interfaces in one enclosure with separate power supply, Linux OS, Mini Maxwell® network emulator engine, graphical user interface, and 90 Day Warranty. The three Ethernet interfaces operate at 10 and 100 megabits/second and support auto crossover (auto MDI/MDI-X). Please contact InterWorking Labs if you require more capabilities than Mini Maxwell offers. Mini Maxwell contains no rotating disks or fans. It generates almost no noticeable heat and is silent. It may be mounted in any convenient orientation. However, a small amount of air circulation is necessary to dissipate the small amount of heat (about 4 watts) that is generated. 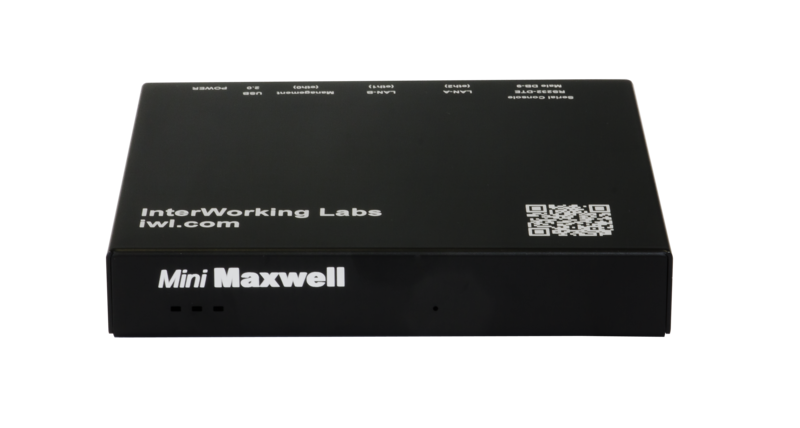 Click the button below to add the Mini Maxwell Network Emulator - NOTE: END OF LIFE SOON to your wish list.